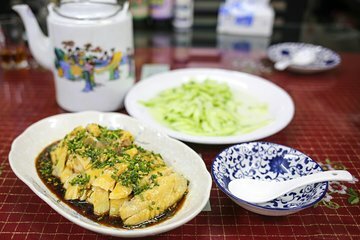 Xangai é uma das capitais gastronômicas mais deliciosas da China, mas saber para onde ir para as delícias mais saborosas exige conhecimento local. Chega a quatro restaurantes de gerência familiar durante o rastejamento de comida do informante, encimado por uma cerveja artesanal em um pub local. Você vai se aventurar longe da rota turística enquanto se delicia com 12 clássicos regionais, feitos a partir de receitas transmitidas ao longo de gerações. We had a blast! Right from the get go Tingyu, our guide was bubbly, fun and full of energy and interesting information. The five venues we visited were all different and amazing in their own way, some traditional and some, like the craft beer bar, more modern. All of them stunning food and beverage options. Tingyu ordered ahead so that our meals were ready when we arrived. We were lucky to have only four other people on the tour with us which made it loads of fun. We would highly recommend lost plate tours and if you get Tingyu as your guide your in for a treat!